Talk to the hands gentlemen. I’ve been a fan of the Assassin’s Creed series since I heard that the first game would be set in the ancient middle east. Once I got the game and experienced the setting for the first time I was hooked, and not on the ancient setting. 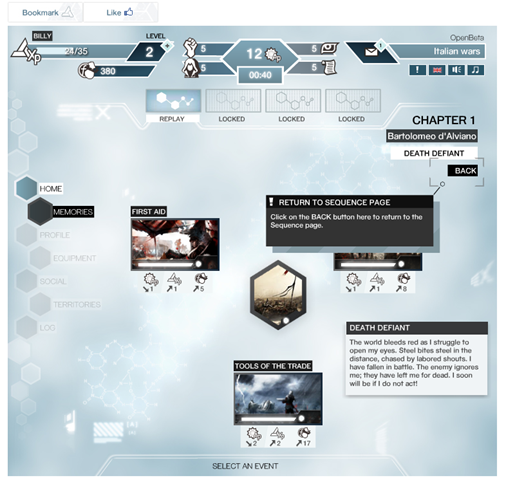 The story of Desmond Miles is much more interesting to me than either Altair or Ezio Auditore Da Firenze, and I had decided that while I liked the AC series, I was probably going to skip Brotherhood due to it’s multiplayer heavy nature and what I assumed would be a lackluster story of Ezio just tacked on. Boy was I wrong. Brotherhood is just as much a standalone game as Assassin’s Creed II is, even more in some cases. The truth is that they should have called the game Assassin’s Creed III. 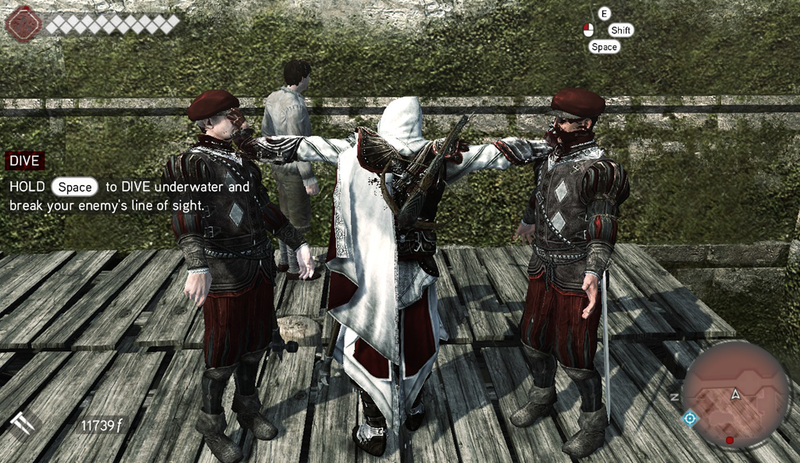 Sure, it’s still Ezio and the overarching Desmond plot isn’t moved forward as much as I had hoped, but the story was enjoyable and more importantly Brotherhood showed me that they weren’t going to keep the series stale gameplay wise. While the controls are mostly unchanged from II there are some minor changes, a few major ones, and some multiplayer specific cntrols that I am hoping they port over to the single player campaign. Specifically the targeting control. In the multiplayer you can press the middle mouse button and move your cursor to your target,. When you let go the target will be locked. In the single player game you have to face a target, hope it guesses the right one, then press the lock button. It will then decide to lock on to other enemies for no apparent reason, especially if you are trying to shoot someone with the gun for a 100% sync. The single most important change between II and Brotherhood is the fact that you are put in charge of recruiting and ‘training’ new assassins. This takes the form of rescuing potential recruits from the Borgia’s men, then inviting them into the Assassin’s Guild. After that you can call them in at any time to help kill your targets, or use them to distract enemies while you get away. Keep an eye on them though as they can be killed. Your other option for getting your recruits more XP is to send them on missions in other cities around Europe. This is mostly a fire and forget scenario but it really drew me in, from the stories to the personalization of each recruit. I had a special recruit who had been with me much longer than the others, so I gave him a nice dye job for his robes. Eventually your recruits, if you spend enough time on them, will graduate to full on Assassins. This doesn’t mean you can’t use them anymore, in fact they become killing machines that will help you whenever you need them. This is especially helpful when you get in over your head and are surrounded by dozens of guards. There is nothing more satisfying than looking out over a wave of Borgia men, pressing a simple button three times and seeing five badass Assassins come flying down from the rooftops to help eliminate your foes. The graphics are starting to show their age, though I still couldn’t run it at full settings due to my new interim graphics card being crap. Still, even when I turned the settings to full they weren’t the best, even of console ports. It’s still a pretty game, just not breathtaking like the first Assassin’s Creed was. The sound is still good, just nothing amazing. You won’t be immersed in the setting like you would with a game like Bioshock, but the sound effects and music are still enjoyable enough. The multiplayer is, next to the Assassin recruits, the breakout of the series. I wish there were more people playing it, as it’s sometimes hard to find a game on the PC, but the gameplay is much more interesting and unique than any other multiplayer I have ever experienced. There is NOTHING like the feeling of being hunted by half the people in the match, and knowing they are closing in, all the while you are trying to find that one person you are hunting. You can slip into a group of NPCs that look like your character, walk around a bit and when one of your hunters tackles the man next to you, you can punch him in the back of the head and knock him out, giving you time to slip away into the crowded streets. Your kill to death ratio probably won’t be as high in Brotherhood as it would be in say, Black Ops, but it’s more about HOW you kill your target. You’ll get a measly 100 points if you sprint after your target through the crowded streets, but if you manage to blend into a crowd and wait patiently for your target to walk past and stab him without breaking cover you’ll get 500 points, but you need to pay attention to the time left, as well as the people hunting you. It’s a constant give and take, choosing when to go for your kills, and knowing when your target is going to get away. It also feels amazing once you’ve leveled up enough to get the pistol. Then you can know your target is going to get away and drop all pretense. You can then take them out at range as a last “F You” before they escape over the rooftops. All in all I think that Brotherhood is by far the best of the series. I hope they include the recruits and multiplayer in Assassin’s Creed III, but even if they don’t all they have to do is continue where Desmond leaves off at the last moments of Brotherhood for me to buy it as soon as it comes to PC. Some of you may remember my earlier post about Progress Wars, a spoof game designed to poke fun at games like Mafia Wars. The idea behind the ‘game’ is that you just keep pressing the “perform mission” button until the bar fills, then it advances your level and you do it again, and again, and again. While the two may not look the same at first glance the gameplay couldn’t be more similar. In Project Legacy you will select a memory to work on, and once you complete it new memories will open up for play. But when you actually select a memory, it will give you a small paragraph of information and background, and then you will click the “execute” button until the bar is full. Congratulations! You have just finished the memory. Sure they tried to make it more interesting by giving you XP to level up, and money to buy items. Some memories can’t be completed until you buy an item or a soldier or what have you. None of this matters though when you consider the fact that the only “gameplay” in this game is clicking execute until the bar fills or you run out of AP, which will regenerate over time. I hope they paid Jakob Skjerning, the creator of Progress Wars, a royalty of some kind. In short: Good God why isn’t there a law requiring people who make games like this to get punched in the face? Is preventing piracy worth killing a market? Congratulations are due to Ubisoft. 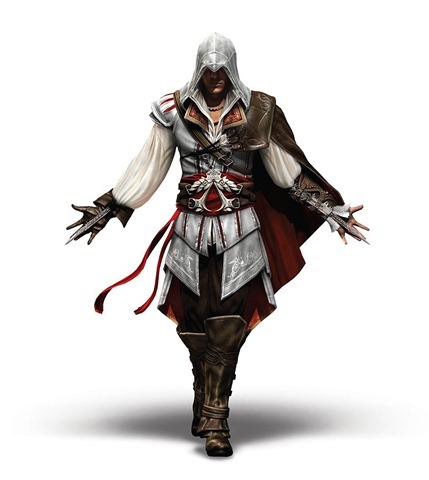 As of today I haven’t heard of any confirmed cracks for Assassin’s Creed II (There are rumors, and there are counter rumors, and there are rumors that it is out there but is gimped in some way). Of course there was that small hiccup that prevented people from playing the game for over 12 hours, but that is a small price to pay to prevent piracy. I had planned for this blog post to slam Ubisoft’s DRM, talk about how worthless it is and how even if it works people will boycott the games that have it and we will show Ubisoft that we won’t suffer broken products! Sadly I don’t think that this is the case at all. I don’t believe that their addition of ridiculous DRM has hurt the games sales on the PC in any way. I also don’t believe that it has helped the sales, after all pirates probably aren’t going to buy your game anyway. We won’t know for sure until sales figures come out but my guess is that the public has spoken. We may rail against all things DRM but it hasn’t stopped us from purchasing these games (I sadly bought it on the 360 long before I heard about the DRM included in the PC version. If I had known I never would have bought any copy). And don’t think that hearing about the PC’s DRM and deciding to get it on a console is going to “show” Ubisoft anything. They still got your money, and the money of thousands of other irate gamers. We like to think that we stick to our guns and if a company does something terrible we won’t suffer their crap, but the truth of the matter is that Ubisoft games will continue to sell on PC and console, Activision games like Modern Warfare 3, 4, 5 and 6 (all coming in 2011 probably) will sell, and there is nothing we WILL do about it. They called our bluff, smacked us in the face, and we will still come crawling back throwing money at them when the time comes. Well played Ubisoft, well played. I’m going to go take a hot shower and debate changing my hobby from gaming to wood carving.